Quick posting to Twitter and Facebook was one of my much-loved features in iOS 6, so I was horrified to find it was missing in iOS 7. I had been following the iOS 7 betas closely hoping Apple would bring it back for the final release – but they didn’t. 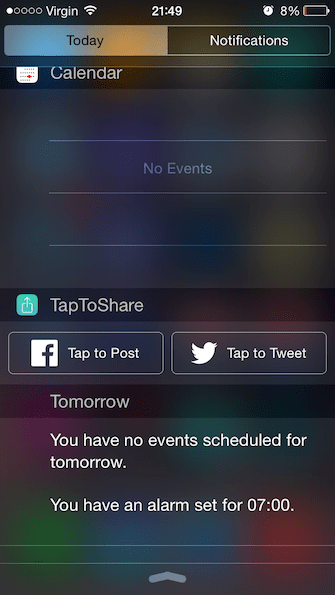 So in January 2014, I found and wrote about a jailbreak tweak called Share Widget for iOS 7 that brought back this feature. It was brilliant, bringing back my much-loved feature – however, it was quite unstable. Also, whilst jailbreaking is much easier than ever before, not everyone wants to do it, and installing jailbreak apps/tweaks can be a little risky. When Apple announced iOS 8, I once again hoped they were going to bring back the Tap To feature, but alas they didn’t. 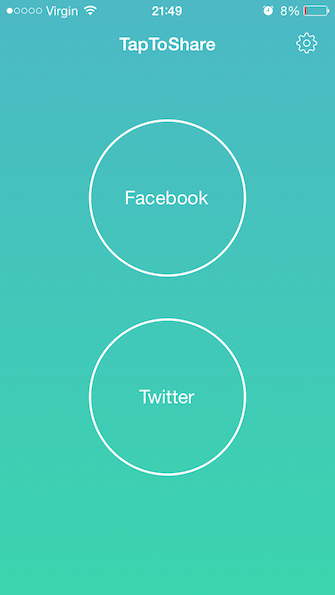 Luckily there is now an app available for iOS 8 called TapToShare by a developer called Nonthawat Srichad. This is a regular app you can find App Store and doesn’t require jailbreaking. It adds both an App icon and Notification Centre buttons, enabling quick and easy posting to both Facebook and Twitter. This is a very simple app that serves a much needed task, and I use iy many times a day. I have been running it now for a few weeks and have had no problems with it on my iPhone 5.